A fire service provides access to the water supply system, allowing fires to be easily extinguished when they break out in or around a property. This service encompasses various components, including water fire hydrants, sprinkler systems, hose reels and more. Lateral Plumbing Solutions can help ensure your fire service functions correctly and complies with all relevant regulations. Our goal is to avoid complications for fire-fighters while providing you with the peace of mind you deserve. We can provide quick and efficient assistance with installation and maintenance of fire services in Melbourne. 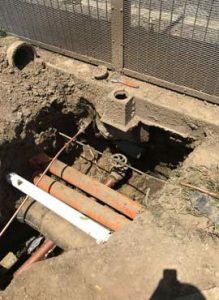 We can install appropriate fire service valves and fittings that adhere to stringent Australian Standards and even conduct emergency pipe repair for a burst water fire pipe. Our licensed plumbers are experienced when it comes to fire service piping, including valves, hydrants, hose reels and backflow prevention. Don’t risk having a non-compliant fire service. If you need assistance installing or maintaining a fire service in Melbourne, call Lateral Plumbing Solutions today to learn how we can help.